Lambert was privately owned by a family in West Texas. They purchased him as a pet for their children, but soon realized that Lambert was getting to be too much for them. 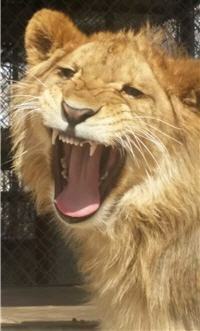 They contacted us, and chose to donate him to In-Sync Exotics. 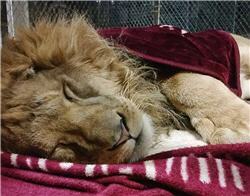 We are very grateful that they made the decision to place Lambert in a home where he can live with others of his kind, and receive the care that a lion needs. 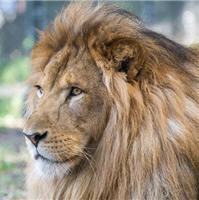 We hope to introduce him to Rafiki, our other young male lion, so that they will each benefit from companionship. We made the 14-hour round trip drive to pick him up on Saturday, 6/14, and he arrived home late Saturday night. Because he has been raised in a house, we decided to keep him inside for his first night, as he arrived after dark and was a little overwhelmed by the sounds of all the other cats at In-Sync. Today, Sunday 6/15, he was moved to a temporary outdoor enclosure, but will be introduced to Rafiki very shortly, and we hope that he will be able to live in the enclosure with Rafiki. We believe he is approximately 3 months old based on his size, but he may be older and just be rather small for his size. 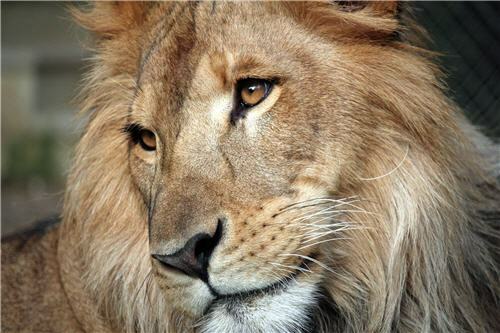 Lambert was named in honor of the lion Lambert in the documentary The Elephant in the Living Room.